This pendant commemorates a special time and place through an "equation" of love. Matters of the heart may not be truly quantifiable, but they can be represented by a customized equation that commemorates your first date, wedding or a special anniversary. 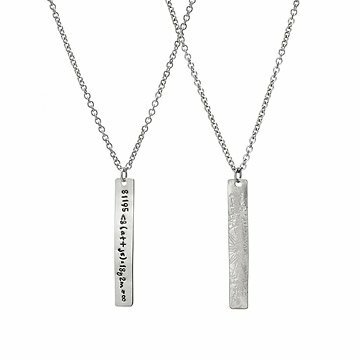 Ana Talukder's recycled sterling silver plaque represents your unique relationship through hand-stamped dates and initials. The addition of these factors, plus "<3" equals infinity in this equation of love. The reverse side of the pendant is impressed with the image of an elaborate, vintage-inspired compass rose, reminding you to keep your relationship on course. Handmade in Seattle, Washington. Gift boxed/ polishing cloth included. Product met all of my expectations. Elegantly captures an event with special meaning. Was a great gift my wife loves it!